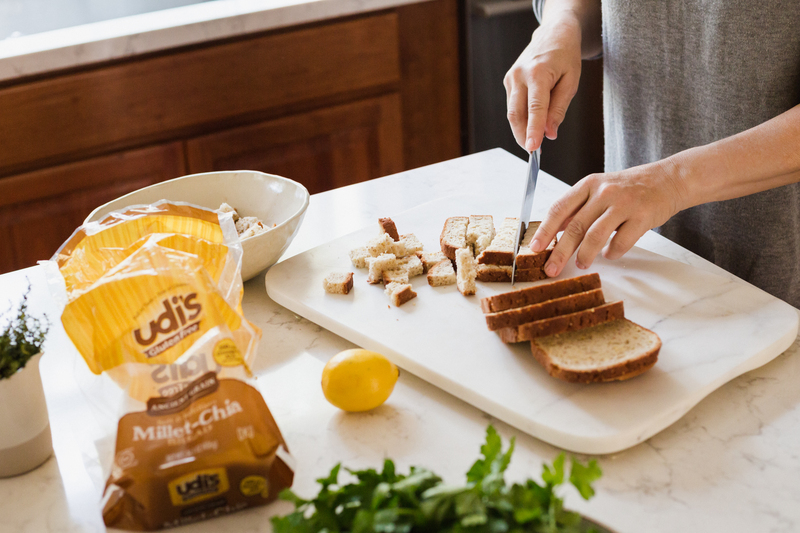 The other week, I was making my children’s lunches using Udi’s Ancient Grain Millet-Chia Gluten Free bread, and thought that this bread would be great as croutons. I’ve enjoyed Udi’s bread for many years. Their products, such as breads, buns, rolls and mixes are good and make eating gluten free so much easier. The addition of their Ancient Grain Gluten Free Millet-Chia bread was an easy sell. Chia seeds are naturally gluten free, high in omega-3 fatty acids, fiber and antioxidants. As a mom, you try and find all the places to add in ‘healthy’ and this gluten-free bread with chia seeds was an easy one. The bustle of the holidays are gearing up and it’s that time of year to plan out the Thanksgiving menu. Most of my memories for a northwest Thanksgiving revolve around my family’s beach and food, plain and simple. Although the turkey was always the hero, we looked forward to the appetizer salad. This salad was not your typical salad but a Caesar salad topped with freshly cracked crab and crunchy croutons. Having crab was such a northwest tradition and truly a treat. This salad was always a highlight and the signal that our dinner was commencing. We are a gluten-free family, with celiac and gluten-intolerances, and over the years I have adjusted our holiday recipes to accommodate these needs. 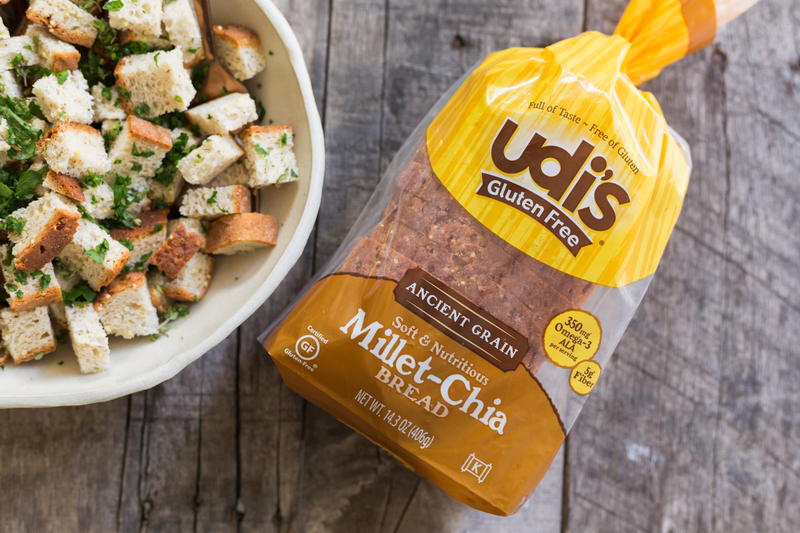 This Thanksgiving, I’ve reimagined our Holiday Caesar salad to a healthier, gluten free salad with the help of Udi’s Millet-Chia Ancient Grain bread. 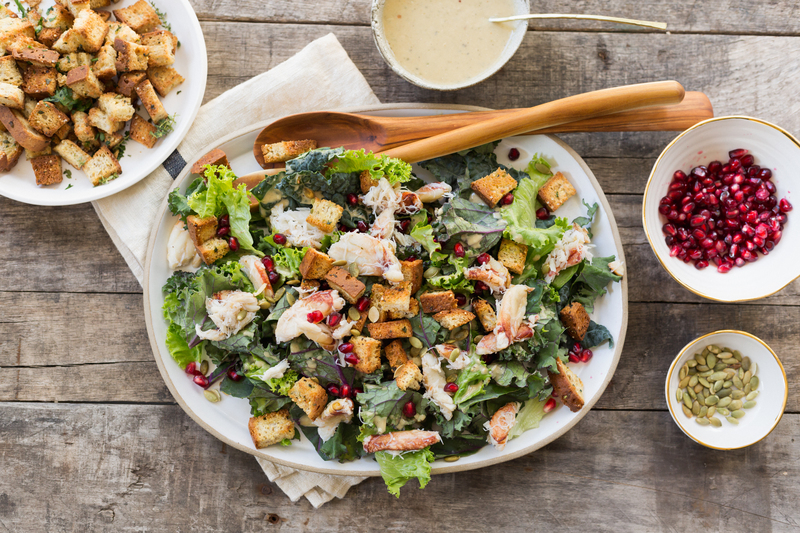 This Kale Caesar salad is topped with freshly cracked crab, crispy herbed, gluten free croutons, pomegranate seeds and drizzled with a vegan pepita Caesar dressing. It’s gluten free, healthy and so delicious. Layer the ingredients for the salad in the order they appear on a large serving bowl or platter. Drizzle at least one cup of the pepita Caesar dressing over the top and serve. If you'd like the kale to be wilted feel free to dress the kale and set it aside in the refrigerator up to two hours before assembling the salad. Enjoy! Pulse all ingredients for the dressing in your food processor. Dressing keeps for up to one week. Pre-heat your oven on the convection setting to 375 degrees. 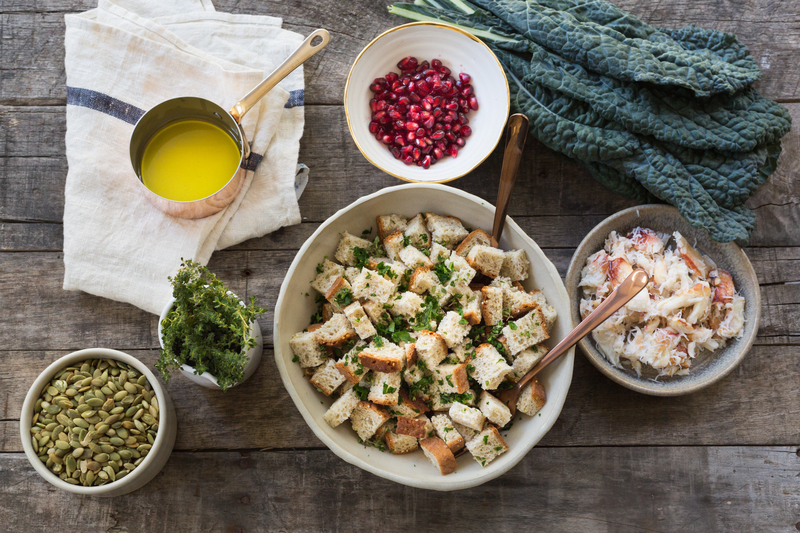 In a mixing bowl combine all the ingredients and gently toss to coat each bread cube in the butter, oil herbs & seasonings. Arrange the croutons on a lined baking sheet and bake for 10-12 minutes. Stir the croutons halfway through baking to ensure they don't burn and evenly brown. *Disclaimer: This post was sponsored by Udi’s and feedfeed. All opinions and thoughts are my own.